Customized by Pro-Gamers - The SteelSeries Rival Gaming Mouse is Coming Soon! Our COMPUTEX 2014 Taipei coverage continues! We hope you enjoyed Episode One and Episode Two. And Episode Three continues to be packed with PC DIY goodness. I this video we kick things off at the W Taipei hotel with be quiet!, jump onto the showfloor with MSI, zip over to Silverstone for a closer look, and close things off with a visit to ZOTAC. The run time for Episode Three of our COMPUTEX 2014 coverage is just over 26 minutes, so make sure you have your favourite snacks and beverage in hand for more computer goodness! 00:35 - We're back at the be quiet! suite at the Taipei W hotel to talk about their new Straight Power 10 series of 80PLUS GOLD modular power supplies, that will be coming to North America very soon. 02:27 - We have a look at some of MSI's prototype boards which include one with USB 3.1 and another that supports DDR4 memory. We also check out boards for the more eco-friendly users, and check out their developments on the gaming and workstation notebooks. 07:48 - Noctua is one of our favourite cooling brands, with an unfortunate color scheme. But that's changed recently. We get a look at some of their new products that will help users running smaller cases. 12:51 - Silverstone shows off a massive new TJ12 case that takes two people to move (and disassemble). And apparently, it's coming to market. We also get updates on three mini-ITX products, and see the new FT05 chassis finally hit the market. 20:40 - ZOTAC is very well known for their graphics cards. But recently, they've been pushing hard to also be known for their mini PC systems. At COMPUTEX 2014, there was a strong push in that direction with their new ZBOX Sphere, that isn't really a box at all, plus a new ZBOX that is completely passive, and one that puts gaming grade graphics inside the box. And that sums up Episode #3 in a nutshell. 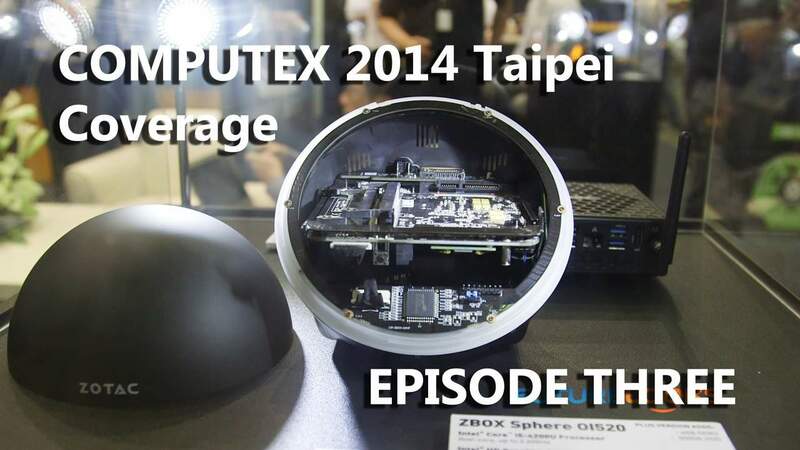 If you haven't watched it yet, make sure you check out Episode #1 and Episode #2 for more great COMPUTEX 2014 coverage. Stay tuned for Episode #4 because it'll be coming up very quickly. And if you missed most of the news releases, you can find them again right here.